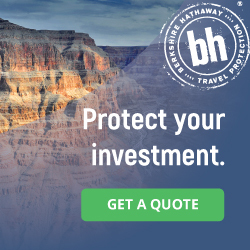 We feel strongly about our travelers purchasing Travel Insurance for any trip they take. There are many different types of Travel Insurance available to you and we can help point you in the right direction so you find the right fit for your journey. Whether you choose to take our advice or you purchase travel insurance on your own, please give this often overlooked detail of trip planning the attention it deserves. You will be directed to a different website when you click the link.